Contains detailed statistical information on every player in the NFL. Listings may be browsed by last name only. Fantasy sports resource and games including football, baseball, basketball, hockey, Nascar, and golf. Fantasy baseball and football news and information to help the user win their fantasy league, including injury reports, statisticss and cheat sheets. The official 2007 sports fantasy game for the Super 14 rugby union, hosted by FOXSPORTS.com.au. Offers customized fantasy sports leagues. Commissioner leagues and single teams. Free 2 week trial period. Offers NFL, NBA, MLB, NHL, PGA, NASCAR. Fantasy Sports Community with news, analysis, games and more. Baseball, football and basketball fantasy games and leagues. Offers free fantasy Baseball, basketball, football, and hockey for prizes. Statistical tools for fantasy sports drafting, based on previous years data and user opinions. Directory listing of free and pay fantasy leagues. Also find original articles, picks, news, and information sites. Directory of free and pay fantasy leagues, plus original articles, live scores, and news. Tips for baseball, football, hockey, and basketball. Fantasy football, baseball, and basketball, rankings, projections, dollar values, cheat sheets, news and links. Free and fee leagues. Free fantasy sports basketball, baseball, football and hockey. Win prizes. Register for several leagues, then return to easily check statistics and change lne-ups. Compete with others playing fantasy baseball online. Free and pay leagues available. Offers pay to play head to head fantasy football leagues on the web. Fantasy basketball sites, free and pay leagues, news, scores, and basketball message boards. Fantasy sports articles, player rankings, news, and forums. Free rankings, projections, draft information and player news. Cricket, tennis, rugby and cycling fantasy sports games. Currently free. A fantasy basketball weblog with articles posted several times/week. Major NBA news covered with fantasy perspective. SEC sports message board and open forums. Free to join, sports talk, political discussions, pick-ems, and fantasy leagues. Offers personalized email, cheat sheets, articles, fantasy information, NFL and fantasy schedules, chat room, bulletin board, and FAQ. Provides cheat sheets, fantasy discussions, and fantasy leagues. Head-to-head fantasy baseball and football leagues. For advanced players, try 'Challenge style' Fantasy Sports Championships for baseball, football and basketball. Custom designed fantasy football logos and helmets. If the business hours of Yahoo Sports - Player Profiles in may vary on holidays like Valentine’s Day, Washington’s Birthday, St. Patrick’s Day, Easter, Easter eve and Mother’s day. We display standard opening hours and price ranges in our profile site. 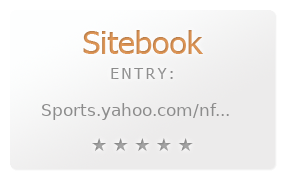 We recommend to check out sports.yahoo.com/nfl/players/ for further information. You can also search for Alternatives for sports.yahoo.com/nfl/players/ on our Review Site Sitebook.org All trademarks are the property of their respective owners. If we should delete this entry, please send us a short E-Mail.